Mumbai is India’s richest city and home to a human population of around 20 million, but it also is home to the biggest national park inside a city – the Sanjay Gandhi national park, which is the size of 30 Central Parks! The park is home to more than 1,000 species of plants and animals, most significantly, leopards. 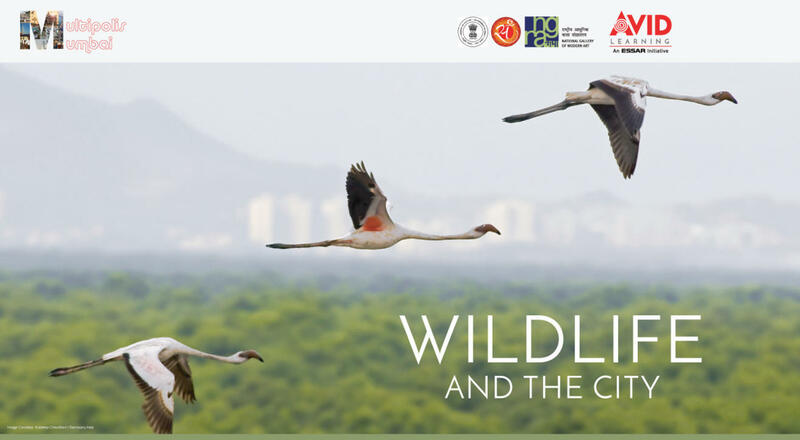 NGMA Mumbai, Ministry of Culture, Government of India and Avid Learning present Multipolis Mumbai: Wildlife and the City. Join our panel of experts, conservationists, naturalists and wildlife watchdogs to discuss the histories, patterns and attendant challenges related to wildlife in an urban context. Environmental Activist and Writer, Founding Editor of Sanctuary Asia Bittu Sahgal, Wildlife conservationist and co-founder of Wildlife SOS Kartick Satyanarayan, Conservationist, Large Carnivore Biologist and President of Wildlife Conservation Trust (WCT) Dr. Anish Andheria will be in conversation with Creative Editor at Arré Karanjeet Kaur. These experts will weigh-in on issues like importance of bio-diversity in an urban context, ways to reduce human-animal conflict in urban areas and the role of technology in the conservation of wildlife in an urban environment. They will also discuss Urban Evolution, preservation of habitats, and encroachment, how species are evolving to survive in cities and, alas, extinction. How do aspects of the city like human density, architecture, pollution, resource dispersion and infrastructure systems affect and evolve its animal populations? What are the avenues and initiatives through which urban residents can engage with, learn more about and aid animal life? This discussion is part of our Multipolis Mumbai series, which decodes the past while looking to the future and finding novel ways of engaging, interacting with and re-energizing the city we love! This series was begun and had a successful run in 2012 and we revived it in June 2017. In the second iteration, we seek to go deeper and unearth more fascinating nuggets about our ever-surprising Mumbai! We've already had panels on the re-haul of our historic precincts, the role of the business families of Bombay, Art Deco in the City and looking at the city through a child's eyes. More recently, we’ve had a discussion around how art institutions and practitioners in the city are harnessing the power of tech, and how poets and women writers engage with and write about the city. We've also recently held a workshop that looked more closely at celebrated classical architecture (namely Indo Saracenic and Victorian Gothic) of one of our oldest areas. We now turn our attention to the non-human residents that share our city. Bittu Sahgal is an environmental activist and writer. He is the founding editor of Sanctuary Asia, a wildlife and ecology magazine based in India. He is a member of the National Board for Wildlife of the Ministry of Environment and Forests. He has been associated with Project Tiger from its inception and was greatly influenced by Dr Salim Ali the famous "Birdman of India", Kailash Sankhala, the first Director of Project Tiger and Fateh Singh Rathore, Field Director, Ranthambhore Tiger Reserve, to propagate the concept of tiger protection in India. He founded Kids for Tigers, the Sanctuary Tiger Programme in the year 2000. A mass contact campaign, this reaches out to over 650 schools in 15 Indian cities and covers one million children. He has authored numerous book on wildlife including, most recently: India Naturally, The Bandhavgarh Inheritance, The Sundarbans Inheritance, The Bharatpur Inheritance, The Kaziranga Inheritance, The Corbett Inheritance and The Periyar Inheritance. He writes for both English and local language newspapers and magazines in India and has produced over 30 conservation-related documentaries. Kartick Satyanarayan and Geeta Seshamani founded Wildlife SOS in 1995, dedicating their non-profit organization to protecting India’s environmental and wildlife resources from unsustainable exploitation. They brought to an end the centuries old barbaric practice by rescuing over 600 ‘dancing bears’ and providing alternative livelihoods to the Kalandar communities previously depending on bears. With a degree in business, Kartick manages Wildlife SOS as CEO and oversees 11 wildlife rescue and rehabilitation facilities for Tigers, bears, leopards, reptiles, birds and elephants. Kartick is a member of the IUCN Bear Specialist Group (Sloth Bear Team Expert), the Wildlife Crime Control Bureau, former member of the State Wildlife Advisory Board of the Government of Jammu and Kashmir and Government of Uttar Pradesh, and the Executive Board of Friendicoes – SECA in New Delhi, India. He is a former Member of the Government of India’s Central Zoo Authority (2007–2013) and an Honorary Wildlife Warden of the Government of NCT Delhi. He is a TED International Fellow and recipient of the Indira Gandhi Paryavaran Puraskar Award (2010). He has also received the First Planman Media Award for Environmental Activism (2009), The Elisabeth Lewyt Award for Disaster Management and Planning, and the Karamveer Puraskar of the Congo Civil Society (2009). Kartick’s current focus is the mitigation of human-wildlife conflict in India through a series of workshops in bear habitat communities. Educating people about how to avoid animal conflict while fostering an appreciation for wildlife will save human and animal lives and enhance conservation of India’s natural resources. Dr. Anish Andheria is the President of the Wildlife Conservation Trust (WCT), a not-for-profit, set up to preserve, protect and conserve wildlife and fight climate change. Currently, WCT works in and around 160 national parks and wildlife sanctuaries spread across 23 states of India and catalyses path-breaking conservation action. He is a member of the Maharashtra and Madhya Pradesh State Boards of Wildlife, and of the Steering Committee of Madhya Pradesh Tiger Foundation Society. He is on the Executive Committee of the 'Village Social Transformation Programme' of the Government of Maharashtra. He has been awarded the prestigious Carl Zeiss Conservation Award in 2008 and UAA-ICT Distinguished Alumnus Award’ in 2017. He is a large carnivore specialist with immense knowledge on predator-prey relationships and has contributed to several carnivore conservation projects across India. A professional wildlife photographer of repute, his collection of over 300,000 images serves as a veritable archival record of wildernesses of India. He is a Trustee of the 'Conservation Wildlands Trust' and 'The Climate Reality Project India'. The National Gallery of Modern Art (NGMA) Mumbai, Ministry of Culture, Government of India is a repository of the cultural ethos of the country and showcases the changing art forms through the passage of the last 160 years starting from about 1857 in the field of Visual and Plastic arts. The first NGMA was opened in New Delhi at the historic Jaipur House, in the presence of Prime Minister Jawaharlal Nehru and artists and art lovers on March 29, 1954. The National Gallery of Modern Art, Mumbai was opened to the public in 1996. It hosts various exhibitions and also has its own art collections comprising paintings, sculptures and graphics with a focus on Indian and International artists. It is located in the precinct of the former auditorium the Sir Cowasji Jehangir Public Hall and the Institute of Science. This architecturally marvellous building was designed and built by the famous British architect George Wittet which has been completely redesigned keeping only the facade edifice that was Public Hall. It has hosted eminent artists like, K.H. Ara, F. N. Souza, Gaitonde, S.H. Raza and M.F. Hussain and contemporary artists like, K.G. Subramanyam, Sudhir Patwardhan, Nalini Malini, Atul Dodiya and Sudarshan Shetty. The NGMA in Mumbai is run and administered as a subordinate office to the Ministry of Culture, Government of India, which has two branches one at Mumbai and the other at Bengaluru. Avid Learning, a public programming platform and cultural arm of the Essar Group, has conducted over 900 programs and connected with more than 100,000 individuals since its inception in 2009. Driven by the belief that Learning Never Stops, AVID’s multiple formats like Workshops, Panel Discussions, Gallery Walkthroughs, and Festival Platforms create a dynamic and interactive atmosphere that stimulates intellectual and creative growth across the fields of Culture & Heritage, Literature, Art and Innovation.